A Monet style beach painting with a sunlit palm tree by the sea! The sparkling water is a kaleidoscope of color! A swaying palm tree graces this tropical seaside painting. 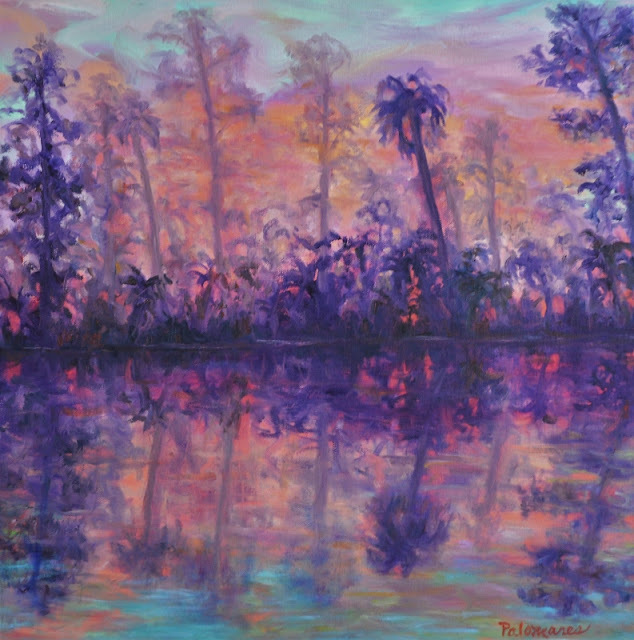 This coastal painting would make a peaceful statement in a beach house with beach décor! A vibrant seaside coastal painting with a sunrise over the ocean where a Pelican is perched on a piling. The nautical painting is whimsical with the "No Wake" zone weathered wood sign. I painted a little humor in this nautical piece of artwork because I am not a morning person. Mr. Crabby is not a morning person either! This nautical painting would be a lovely addition to a coastal and beach style home. 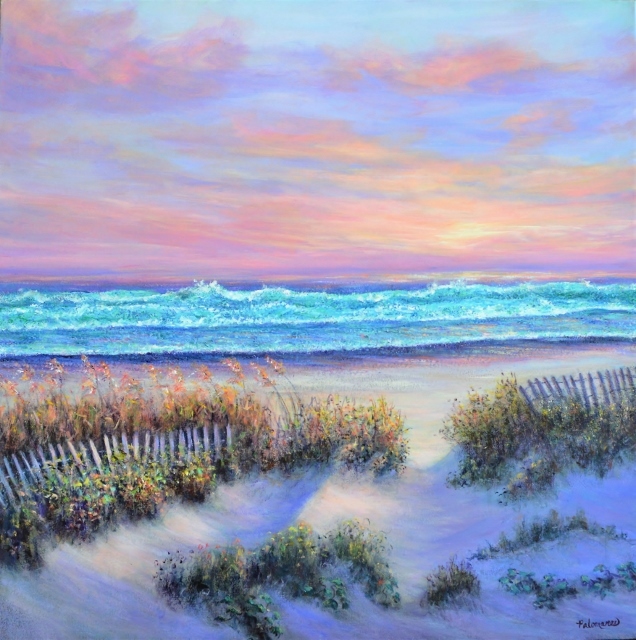 This colorful seaside painting would add a punch of color to any coastal or beach décor. To purchase this Pelican Painting visit my Original Paintings Shop! 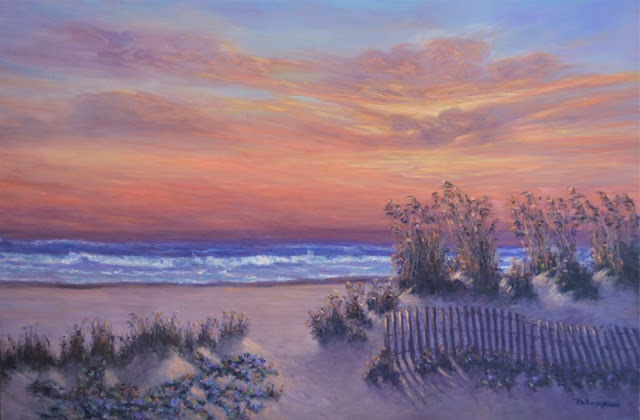 A glorious and colorful beach painting with a sunrise that greets you as you walk on the path past the Morning Glories (Railroad Vine). The swaying sunlit sea oats greet you. Footprints in the sand guide you past a weathered fence to the sparkling blue ocean! Coastal living and traveling by the sea inspires so many of my paintings. This beach painting was inspired by a path on South Padre, Island, Texas. I returned to my childhood beach for a vacation. The time spent on the island brought back so many memories of our fishing and camping trips. This tranquil coastal oil painting would make a lovely statement in a coastal or beach style home. This colorful seaside painting would bring some sunshine into a room with coastal décor! This enchanting landscape nature painting is done in a Monet style. 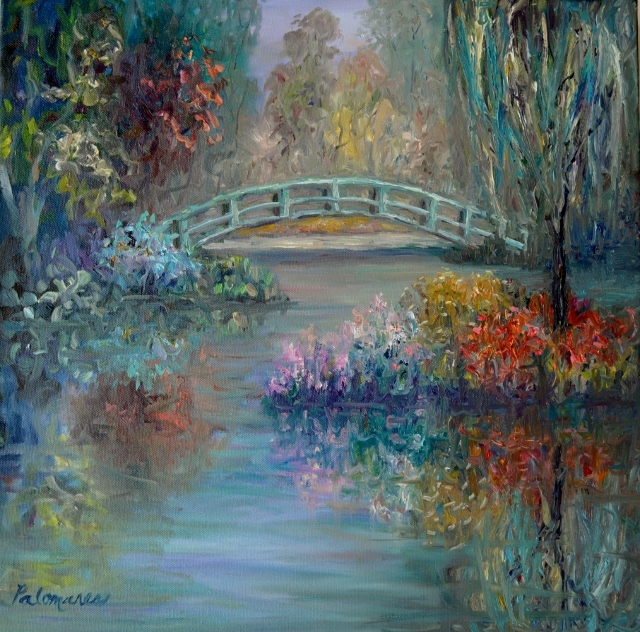 The colorful flower garden reflects into a peaceful pond. A distant bridge and sunlight draw you into a magical place. 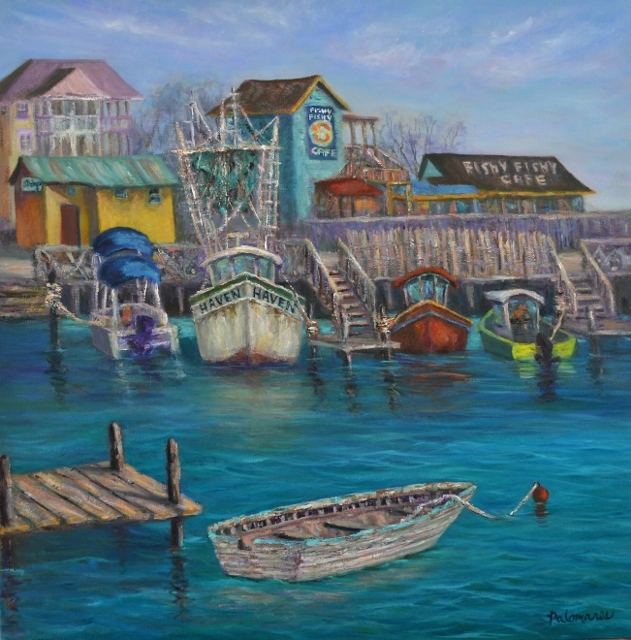 This original coastal harbor oil painting was inspired by Southport, NC where we took a wonderful vacation. We visited the lovely beach communities around Wilmington, NC. We were eager to see the town where the Nicholas Sparks' movie,"Safe Haven", was filmed. This enchanting little coastal community has quaint and colorful cottages. The harbor area has wonderful restaurant like the Fishy Fishy Cafe. I love the rustic buildings that surround the weathered docks. The downtown area has charming little shops and is bustling with tourists! Julianne Hough's character, Katie, sought refuge in this coastal town. 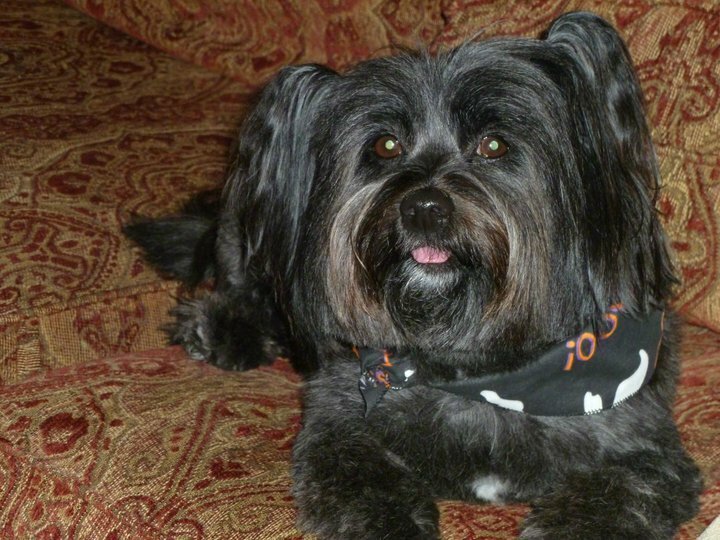 Just like Katie and the boats that are safely tucked in the harbor, we all need a place to feel safe and secure. This colorful seaside painting would be lovely in a home with coastal and beach décor. The painting has tones of blues and teals with tropical colors that will bring a little seaside living into any home. Gallery Wrapped Canvas 1 3/8"
Come take a stroll in this enchanting garden courtyard oil painting. Glorious and colorful potted flowers and plants surround the magical fountain with three bronze figures playing musical instruments. 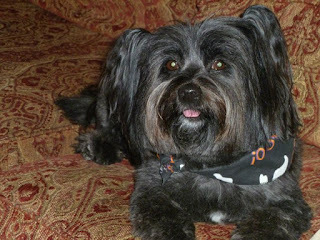 Sit by the soothing sounds of the water fountain and rest for a spell. The Italian courtyard dances with light and leads you past the colorful yellow umbrellas into a secrete garden. Smell the sweet scent of the blue Wisteria that graces the villa. 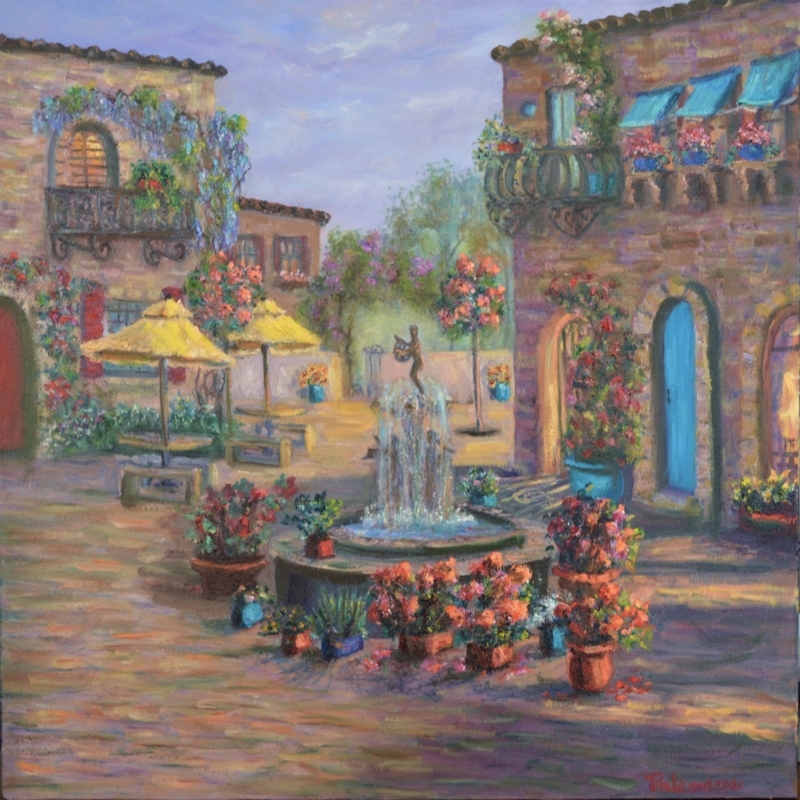 This painting was inspired by the courtyard in Palm Beach, Florida. Strolling through courtyards in Palm Beach, Florida is one of the things I love to do. I am sure that many more courtyards will end up on my canvas as they are so fun to paint. My imagination and "minds eye" embellished this Palm Beach Courtyard. Coastal Seaside Oil Paintings by Professional Artist, Amber Palomares: It is a joy to breath in the morning salt air along the seashore. Gentle ocean breezes sway the sea oats and golden sea grasses in the sand dunes. The gentle rolling sparkling waves glisten with sunlight. An inviting path beckons you to take a walk along the magnificent sea in this coastal painting. This painting was inspired by Cape Cod beaches! This peaceful beach painting would bring a little sunshine into any beach or coastal style home. This impressionist seascape would be a lovely focal point in a room with coastal décor. 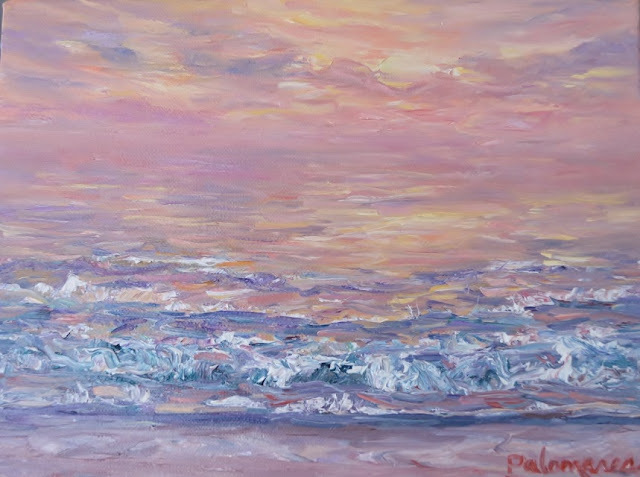 Coastal Seaside Oil Paintings by Professional Artist, Amber Palomares: This coastal painting is a delightful sunny oil painting. A path leads you through down to the beautiful ocean. 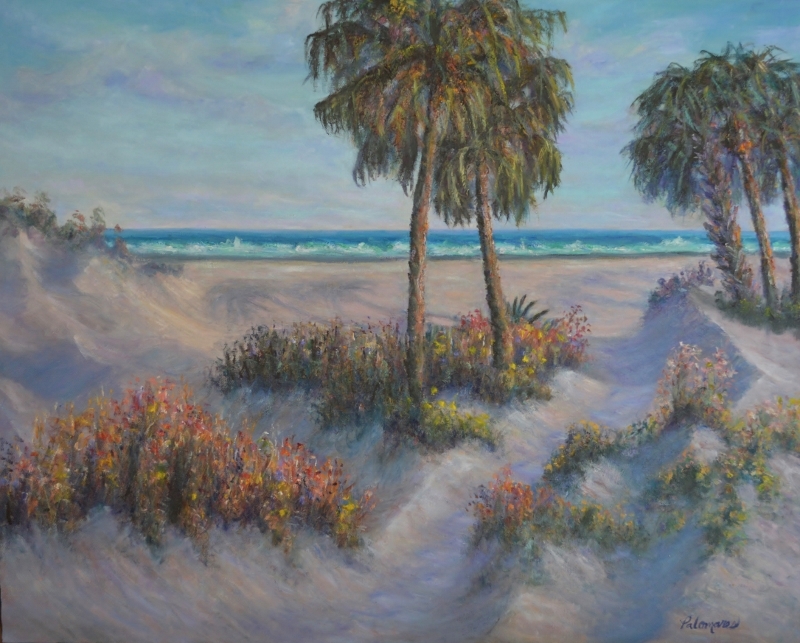 The beach painting features textured palm trees. Colorful natural textures and a 3D feel invite you to take a stroll along the shore! 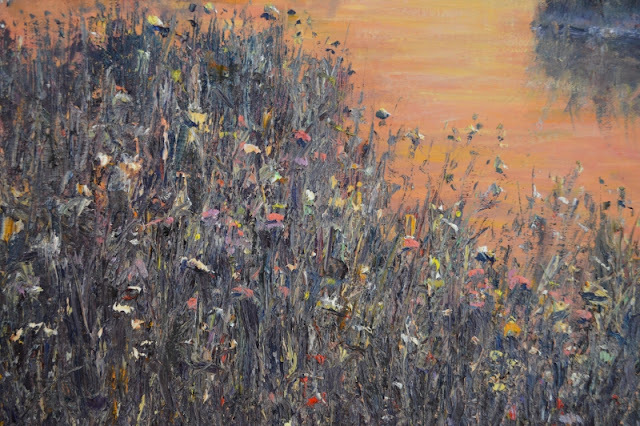 This seaside painting would make a lovely statement in a coastal style home with beach décor.